05.14.07 The results are in! Sam Grindle led his K-6 U1000 Deer Isle - Stonington team to a tied for 14th place finish with 5.5 points and also received the 18th place individual trophy in the K-6 U1000 section. In the K-5 U900 section, Matthew Reale-Hatem of Cape Elizabeth was Maine's high scorer with 4.0 points. The only Maine player in a Championship section, Matthew Fishbein, tied for 13th place in the K-3 Championship and took home the 17th place trophy. K-6 Championship winner and Georgia resident, Ryan Moon. A full photo essay report of Maine players at the Elementary Nationals is coming soon! Thanks to Dan Fishbein for contributing to this report. In the K-6 U1000 section, Sam Grindle of Deer Isle-Stonington scored 5.5, and was Maine's highest scorer in any section. This earned him the 18th place trophy in this very competitive section that had 281 total competitors. In the K-6 U1000 section, Deer Isle-Stonington finished an impressive 14th out of 55 teams competing from around the nation, and earned the 17th place trophy. The top scorers contributing to the score of 15.5 out of a possible 28 were Sam Grindle, 5.5, Hayden Ciomei 4.0, and Connor Morey, Nathan Davis and Chelsea Brown with 3.0 each. Also competing were Nick Eaton 1.5 and Alec Eaton 1.0. In the K-5 U900 section, the top Maine scorer was Matthew Reale-Hatem of Cape Elizabeth, playing in his first national tournament. He scored 4.0 with 3 wins and two draws. He finished tied for 98th place out of 394 players, in a section that required a remarkable score of 5.5 to earn a tied for the 30th place trophy. Deer Isle-Stonington entered a six-person team in this section, and finished 43rd of 66 teams competing. Top scorers for DIS were Andrew Turner 3.5, Walter Kumiega 3.0, Ivan Zembrusky 2.5 and Tyler Bartlett 2.0. Also competing were Sasha Zembrusky 1.5 and Reid Bartlett 1.0. Matthew Fishbein of Cape Elizabeth was Maine's only entry in a Championship section. Maine's current K-6 Individual Champion finished tied for 13th in the nation in the K-3 Championship with 5.0 points, and received the 17th place trophy. His only losses were to the 3rd and 6th place players, who had current ratings of 1779 and 1640. 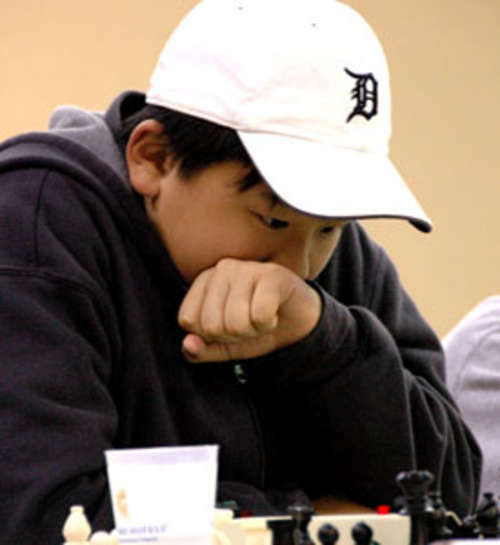 Along the way he defeated two members of 2007 New York State K-3 Team Champion Horace Mann School, the 2007 North Carolina State K-3 Individual Champion, and 5 players with current ratings over 1,000, including one with a rating of 1464. With 2,100 players entered (almost 300 more than last year) and about 4,000 total in attendance, there were opportunities to make new friends from all over the country as well as encounters with Josh Waitzkin, Susan Polgar and Bruce Pandolfini, and great networking opportunities for parents and coaches who want to find new ways to build scholastic chess in Maine. The 15 players and 25 total in the Maine contingent head home tomorrow tired but with a great experience behind them.